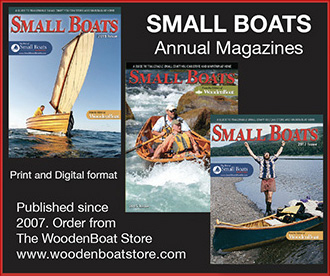 Small Boats Monthly is a monthly web-based magazine dedicated to owners and users of boats that can be stored and maintained at an average-size home. It features a range of designs for oar, paddle, power, and sail. To have unlimited access to Small Boats Monthly, you must subscribe, and whenever your subscription is active, you’ll have access to everything we’ve published from the very first issue to the current issue. Subscriptions renew automatically; as long as your credit card remains valid, you need to take no action to keep your subscription current. We’ll alert you when your card expires, and you’ll simply need to update your card information on your account page in order to maintain your subscription. You may cancel your subscription anytime from your account page or by emailing smallboatscustomerservice@woodenboat.com. If your subscription has expired, you’ll see a prompt to subscribe when browsing our web site. Your access to the current issue and back issues will be restored upon renewal of your subscription. * plus shipping for Canada and foreign orders.